Basketmaker Joe Hogan is strongly influenced by the landscape of Loch na Fooey in County Galway, where he lives and works. His robust, sculptural pieces are woven from native willow, and often incorporate twisted bog wood, birch, ash or holly wood, locally sourced. 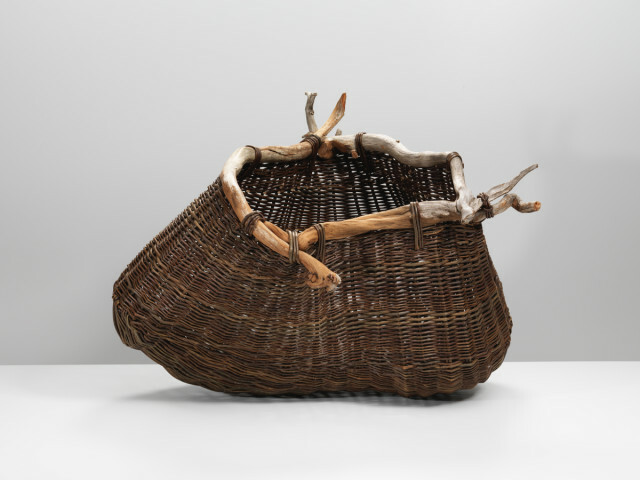 The form of his baskets, pods and pouches is often determined by the lines of the wood, which - gnarled and contorted - provides a powerful contrast to the smooth regularity of the woven willow. The work on show in this exhibition demonstrates the physicality and raw beauty of Joe's work, which exploits the expressive potential of his medium to the full.